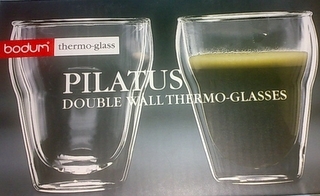 Got these lovely Double Wall Thermo-Glasses from my sister. What is so special about these glasses? Well the double wall act as a vacuum. Therefore, it kept hot drinks hot, and cold drinks cold. Actually what is actually does is that it delays hot drinks temperature from dropping fast. Of course, it does the same for cold drinks. It delays the cold drinks temperature from rising too fast. Another great feature is that even when you pour in really hot drinks, the glass is still nicely comfortable to hold. Just slightly warm. On the other hand, when you store iced-cold drinks, there is hardly any condensation. You don’t get a puddle of water when having an iced-cold drinks. Depending of the sizes and design, 2 x 8oz glasses cost RM 69.00 at Isetan (the price is about the same everywhere). I just love them. Here’s one with a nice cappuccino. 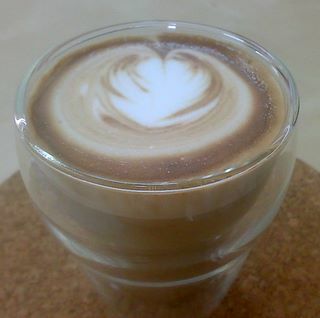 This entry was posted in Bodum, Cappuccino, Malaysia on December 30, 2007 by KF Chan.